As much as we would like to think that the new government funding initiatives are helping all those US states who need it, it's not even close to reality. Some state budgets will benefit tremendously from recent government action, while others will have to wait for the stimulus funds to trickle in. 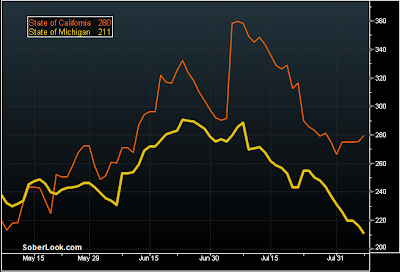 The divergence is striking, as only three months ago Michigan was considered more likely to default on it's debt than California. If you are a tax payer in California, you should be asking yourself a question - why was another troubled state rescued by the federal government (with your federal tax dollars), while your own state has to pay salaries with IOUs? This divergence will only continue as Michigan may be able to issue cheaper debt at some point, while California will likely not have access to the capital markets at all without a government guarantee.